I never met either of my grandmothers, let alone my great-great-grandmothers. But over the last decade or so, I have received much pleasure from reading the astonishing love letter left by my great-great-great, many times great, grandmothers and grandfathers, the sages of my ancestral line. In the spiritual tradition I was born into, that love letter is called the Torah, (Teaching)., or the Old Testament part of the biblical cannon. Reading The Art of Waiting, the book I reviewed in an earlier blog, has yielded more gifts than I could fit into one blog post. This is part two of contemplating the messages in that book which I have found misleading. When I came across a passage that spoke about one of the matriarch of the Old Testament, the lessons of that story were once again quite different for me from the ones Belle Boggs attempts to transmit. In the Jewish tradition each Saturday morning we read one portion “parashat” of that “love letter” passed on to us from generation to generation. And the portion of that letter that falls on the Saturday following our birth becomes our special “Torah portion.” When girls turn twelve and boys thirteen they get to choose a number of lines from their Torah portion, chant them in Hebrew and offer a teaching on the meaning of those lines. The mystics of our tradition teach that our birth parashat contains special instructions for our life journeys. The reading called “The Life of Sarah” is the portion of the biblical canon which happens to be my ‘birth portion.” I read it a thousand time, and here are just a few of the many lessons I came away with. The God, Belle Boggs the author of The Art of Waiting doesn’t believe in (she tells us so), but prays to during the two weeks when she waits to find out whether or not her IVF worked, is likely the same God I don’t believe in. The God I not only believe in—but see and touch daily through personal moments of awe, and in my encounters with clients—is an unexplainable, palpable, sacred Source of Guidance accessible to each of us if we are willing to follow the thread of desire all the way home to our most unmasked, most undefended self. It’s the guidance that Sarah followed throughout her eventful life. No, Sarah certainly did not wait. She moved on. After choosing a surrogate to conceive the first child in her clan, she let go of all expectations of giving birth to a biological child. In fact, Sarah laughed when she heard the news delivered by the three guests/messengers about her impending pregnancy. It is not the act of waiting that transformed her but the manner in which she and Abraham lived their lives. Digging wells, leaving their homeland, letting go of the familiar and trusting the unknown. Sarah and Abraham did not wait. They followed the instructions of the same “still, small voice that bolstered Gandhi and King and everyone else who hoped to turn the tide toward a redemptive awareness. Sarah and Abraham refused to serve the false gods of the dogma of the day. They were idol-smashers. That’s how they became the founders of a nation. Not by waiting. The Fertile Heart OVUM Practice is also not about waiting. Those of us who wait for someone more qualified to tell us what to do often end up waiting in vain. We take steps. Small, medium and large steps from a truthful, grounded, well examined place within us. Each step brings us one step closer to meeting our children halfway. Is there a step you’re about to take? Small? Medium? A giant step that gives you the jitters? I remember my mom once told me that it’s easy to have faith when you get what you want and you struggle with it when what you want is not happening. My pastor says prayer is bringing your wishes and worries to God, faith is leaving them there. He also like to remind us the God is not a vending machine. My wonderful, liberal, open-minded Pastor sent Sarah’s story to me as well as Elizabeth’s ( John the Baptist’s mother) to remind me the God doesn’t care about age and he loves to remind me that we make plans and God laughs. Surrendering to what is the something I still struggle with on a daily basis. As my body is still trying to find balance with my hormones even a year after my son’s birth. I don’t have the agony of the two week wait, I start spotting about 3-6 days before my period, so I have a different agony of disappointment. I have been taking the step of using an over the counter, bio-identical progesterone cream. So I am trying to look at the spotting as a my body trying to get back on track and I need to appreciate it and thank my body for it. But damn it’s hard on some days. I am so grateful for my FH practice, it grounds me and holds me tight. This has been a really interesting blog post for me to contemplate. I first read it on a day when my trust in Guidance (or call it God/the UM) was really low. My period was a week late, and I couldn’t help but think maybe I am pregnant. I finally took a pregnancy test after 8 days of waiting for it to arrive. The test was negative, and this unleashed a torrent of angry Os: how dare I be teased like this by a late period, which makes me dare to hope, especially at a time when I felt I was starting to let go of having to use my own eggs to have a child, and to explore other options. I felt at a really low ebb, and was questioning what was the point of all this inner work if I didn’t seem to be getting any guidance at all. The Os raged for several days, and decided there was no God, no UM, nothing out there. But the thing is, unlike Belle Boggs, who prayed & ‘believed’ only during her 2 week wait, I long to have a life-long relationship with this Guidance (and there are many times I do feel connected to it) across all aspects of my life, and not just my fertility journey. I guess my furious, let-down O is a bit like an angry toddler, who, despite being loved deeply by its mother, lashes out in those moments of frustration. But then luckily – as pretty much always seems to happen with me – the anger calms down and I come back to my base place (as the toddler comes back into a loving relationship with its mother): which is, despite the challenges, a recognition that this life is a beautiful thing, and that there is much to be grateful for, and an openness to keep trying to listen out for what Julia calls ‘the still, small voice’; trusting that it is there and that I have the capacity to hear it. The line I love most in this blog is about Sarah & Abraham living their lives by ‘letting go of the familiar and trusting the unknown.’ This resonates deeply as I explore taking steps towards my child which would use cutting edge medical technology. For someone who hates to even take a painkiller, this feels somewhat uncomfortable (and an illogical O is saying, well if it didn’t happen naturally, then maybe it wasn’t meant to happen) . But then I have to remind myself that one of the reasons I am probably still here (and able to make these choices) is because 15 years ago, when I had breast cancer, I also went out of my comfort zone and used modern medicine as one of the tools to heal myself. Hi Bel, I understand the teasing months when your period is late..those would really leave me feeling devastated. The FH practice has helped me to find a path where I am now open to any idea that will help me conceive my baby. Because now I know I will go ahead only if it truly resonates with me and if I feel OK to do it. Also, now I no longer care about what ‘others will say’. In fact, I have come to discover that the people who really matter will be happy to support me in whatever decision I take. They too want for me what I want for myself, but it is often not communicated correctly and leads to misunderstandings. Eg: My mom actually brought up the topics of egg donation, surrogacy and even adoption and tried to hint how any of these means are alright too. I was surprised. I am an alternate therapy practitioner so I will love it if I conceive without any medical intervention, but if that does not happen, I will choose whatever the next best step will be. Thanks for getting in touch. I agree so much about only doing what truly resonates within. I increasingly try and do this with all decisions, beyond just those I need to make on this fertility journey. And it’s amazing how, when I ask myself a question, my body knows the answer (especially if I take the time to get still, say through meditation, beforehand). I love how open your mom is! I’m still working a bit on the part of me that wants those nearest and dearest to me to approve of my choices, and my wonderful mother, while not actively trying to dissuade me from egg donation, has said there’s no way she’d do that herself. And an O in me wants my mother’s approval and blessing! I find it so amazing that the story of Sarah has popped up FOUR times randomly in my life these past few weeks. From Mass to podcasts to a blog article and now this. I tend to find/look for signs in the world, and while I don’t always know if this is helpful, I do find some significance in this story of Sarah. I relate to it so much. I know that longing so well, and I know the doubt FAR too well. Especially as each month goes by and I’m just that much older. I feel my life is a constant stage of waiting. Waiting to ovulate, for my period, for guidance letting me know what to do next, for a paycheck, for a baby, for things to get better, for the next shoe to drop, for the next trauma. I realize it’s such an orphan-rooted way to live. I recognize it now. I am striving to be more visionary, because so often my orphans mute out anything the visionary tries to tell me. Last month I might have said my next step would be a min-stim IVF protocol. But I didn’t do it. I couldn’t. Why? I’m not sure, but every cell of my body said no. My brain knew why this was a good idea, but I just couldn’t do it. I made the choice not to do IVF for now, but it wasn’t without some doubts that I chose the right path. I’m terrified saying no to medical help will mean I’ve just said no to the baby. So the steps I’m taking now are to just do my practice regardless of how I feel and focus more on my spirit than my physical self. That’s not to say I’ll start eating Twinkies and Diet Coke. I find myself obsessing about all of these different physical things I can do to get my baby, from vitamins to acupressure to yoga. I have a great handle on food and fitness and health, but I don’t find myself focusing as much or putting as much faith into the spiritual/mental side of this journey. And so far, having spot-on hormone levels (except for AMH. Screw AMH) and ovaries that “look much younger than” my age aren’t exactly doing the trick. So something is missing. I’m pretty much an orphan-ruled state right now. I want to focus on getting some peace about my decision to forgo IVF right now and try to find some hope and belief that this baby is possible for me. I want to be able to make the next decision from a peaceful, visionary place and not one of panic or desperation. this is so beautiful! I can feel your honesty with yourself and it helps me take a deep breath into all those places where I am “waiting” or have doubts. To just be where I am in all of it. So great! Thank you Julia for this blog post. I have reminded myself to clarify the difference between waiting and surrendering/bowing to what is. It was interesting to read about the Jewish tradition of ‘birth parashat’ and as I am writing this comment I am seeing a similarity between the word ‘parashat’ and ‘prasad’ in Hindi which means blessing. That’s beautiful how words that sound the same in different languages may mean the same. For me, the next visionary rooted step is to examine my commitments and be present for all or most of my commitments not just work commitments. It’s not easy but I am going to keep on that path and keep clarifying. Also this post reminded me about my need to connect with my roots. I will be attending a 4-day retreat to strengthen my traditional roots in December with my mother. I hope to spend some time reconnecting in the days running up to that point and let that experience enrich me. Right now just staying healthy and trying to get get rid of this sore throat lingering for weeks is challenging. Looking forward to tonight’s call. Have fun at the retreat, that too with your mom. How wonderful! One step that I have decided to take is move to another city. One that is less polluted, less crowded and more relaxed. All my life I have lived in the same city, so this will be a big shift. Also, it will take me away from my parents and siblings. But some distance may do good for our relationships. It’s just a 3 hour drive so I can visit when I want. “listening to that small still voice”. I love that. It is so much easier for me to discern the voice of the ultimate mom from my orphans as I evolve in this work. I am taking steps to make time for myself to journal more often so I can hear my fears and also my hopes. I used to love writing way back in my early years. Even when I was in nursing school I took extra classes in creative writing. I am allowing this part of myself speak up some more. I have been using The Grand Hall of Forgiveness – this imagery feels very soothing to me which I feel I need right now. It was lovely getting in touch with all of you during yesterday’s call. Even if I spoke at the very end and not much, I got so much useful insights and ideas out of all the discussions that took place in the call. I now have a task and commitment over the next two weeks. Visionary steps to be taken for myself: practice body truth day & night, re-read chapters for ‘the fertile female’,pay attention on my diet & dreams (write then down), sleep at least eight hours per night; and at the very end, produce at least one written piece of work over the next two weeks (being fertile in this aspect is also nourishing to me). Today I had a diagnostic hysteroscopy in the uterus,to see the endometrium. All is well I was told. The only reason of having a thin endometrium I was told is that the fact that I’m not properely ovulating. This is what medicals doctors believe given my 42 years of age. I don’t buy on this and will make the change by practicing and taking visionary steps from within. I love you all and thank you for your wonderful experiences you’re sharing with us. One of the most valuable things for me about the OVUM practice has been to really clarify my longing. Beyond “I want a child.” Continuing to listen to and care for my orphans and to hear the Ultimate Mom wisdom so readily available, I have been able to tease out a longing that is much more specific than just wanting a child. For years I have not understood how God/the Universe could put this longing to have a child, to be a mother, in my life and not give me an avenue to fulfill this. Yet, as I have come to know my longing more deeply, I see that I have had multiple opportunities and ways to fill it. I was so blinded by what I felt I was missing, it was hard to see how it was in front of me. My deep longing is to create safe space for little ones – that space where they can be their messy, scared, beautiful, creative, emotional selves and not be shamed for it. I have done this in my healing practice for years. I have done it with women I work with in my recovery community. I have done this with the children I nannied and the ones who I taught in pre-schools and summer camps and elementary schools. I have been fulfilling this longing for years, I have not been forsaken by the higher power I was questioning… And, the next step for my little family is to move forward with our foster care training. 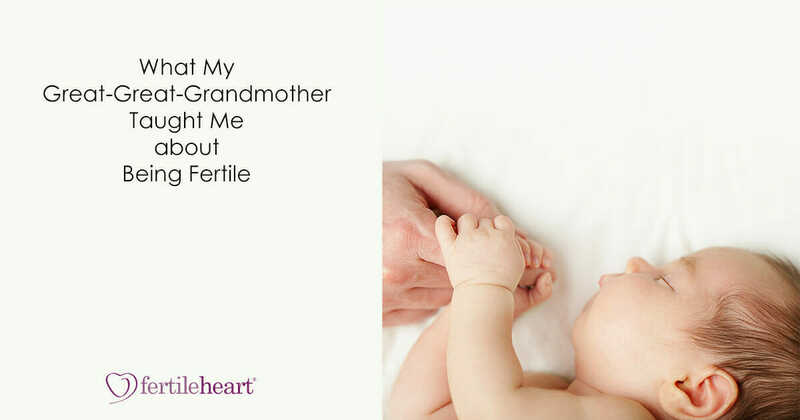 Since beginning the Fertile Heart work, I no longer have shame about my fertility journey. 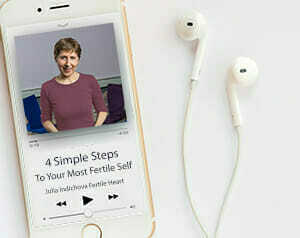 I stepped away from fertility treatments (medical and holistic) a number of years ago – but the feeling that my body was being judged, prodded, scanned, coming up short, lingered for a long time. I can say, I truly believe I am capable of conceiving, sustaining and birthing a child. I don’t know if it will happen, and I’m not interested in forcing it or in waiting. I know what I want – I want – with my husband – to create this safe space for a little one/s to grow and thrive. in the county where I live there are over 30,000 children in foster care today. Sigh. That’s a lot of kiddos who can use the ultimate mom wisdom I have been fostering! So, the next visionary action, the step my husband and I are embarking on this weekend, is to begin to become a certified foster family. I have no idea where this will lead, and I don’t need to know. I’m showing up, taking the next indicated action from a place of a well examined life. This is not based on fear, or shame as so many of my in office medical decisions were made – this is from a place of abundance and gratitude. Here we go!! Oh very thoughtful blog Julia ! It makes me think how a person can perceive the same message in several different ways and I am so glad, God gave me enough discrimination power to “choose” and “act” yet practicing patience and building faith, and without “waiting” for GOD to choose and act on our behalf. Ultimately GOD is actually within us and if we keep on waiting for something to miraculously happen, we can never live our dreams nor move towards our desire. I have firsthand experience living it the way explained by Belle Bloggs. The GOD remains the same, but I was just waiting for tables to turn around. The only way I came out of that misery is through my IVF failure and the doctors turning their backs off me. I can’t just thank God for throwing me into that situation. Yes 5 or 8 yrs back, I wouldn’t have even uttered “thank you”, but I could finally use that situation as an opportunity to find hope somewhere. It was because I chose and acted to join fertileheart community and worked on my orphans with Julia’s amazing guidance and due to all the beautiful souls I met on this path, today I am able to thoroughly enjoy motherhood and blessed with a baby. I am glad, I didn’t WAIT for this day to arrive on its own accord. Once again and forever indebted to you Julia !! How amazing your birth portion is the life of Sarah. How wonderfully fitting. Refusing to serve the false gods of their day is a powerful statement that of course is applicable today. Without getting into a religious discussion, there are many false gods today, one being money. I am taking giant jittery steps right now into the job market after a long absence. There are a lot of intimidated orphans around, but at times it is exhilirating. My husband is also looking for work, so in a way we can share this time even though it does seem a bit like jumping off a cliff since the one job for him is supposed to end by the first week in November. I have been doing Mosaic of Revelations Fertile Heart Imagery (II) and some of the Fertile Heart body truth meditation. My daughter’s relationship with me has taken a strong turn for the worse. I am working to stay on a good path no matter where her challenges blow her. I am so grateful to have a wonderful husband who cares about me and listens and shares with me. My husband’s job road has been rocky for many years and he told me the other day he’d rather have gone through lots of jobs and had a solid marriage than the reverse. How sweet and how true.